There’s no question that non-fragrant, plant-based facial oils have benefits for skin. Most have antioxidant properties and they can be good sources of omega fatty acids, as well as having the ability to moisturize skin. One of the most basic at-home wrinkle remedies is to put a pure oil, like olive oil or coconut oil, on the face. It’s a good solution for dry skin, but for wrinkles, you’re better off treating your skin to a more robust mix of plant oils that revitalize a dull complexion and that you can add to the anti-aging skincare products you already use. This is just a bad idea, full stop. Citrus ingredients, whether from juices or oils, are potent skin sensitizers. Most of them make skin more sensitive to sunlight—and sun damage is one of the leading causes of wrinkles! One of the most straightforward DIY wrinkle remedies is a banana mask. This consists of mashing up a banana, mixing it with yogurt or juice, and slathering it on your face for a few minutes. The theory is that the potassium in bananas will hydrate skin and that the antioxidants it contains will prevent or reduce signs of aging. While a banana is a great fruit that has many health benefits, its effect in a mask is limited at best. The short-term exposure to any anti-aging ingredients it contains won’t make a big difference in wrinkles—you’ll get a much better result if you eat it instead of putting it on your face! And, do we even need to mention how sticky and messy such a mask would be? The problem is that this effect is, again, temporary, and albumin can cause skin sensitivity. 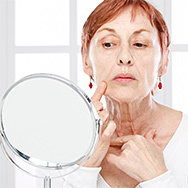 Anything that irritates skin is pro-aging!